ScaleFocus developed for BILSP (BALKAN INSTITUTE FOR LABOUR AND SOCIAL POLICY) the JOB CARE platform, which aims to assist people with disabilities and special needs to find а suitable job position on the market. The solution serves as a mediator between employers and potential employees to create a win-win situation, where demand and supply of the job market meet. People and companies can search for jobs and employees respectively, by filtering the results on the platform per municipality, keywords and specific openings. According to national statistics, more than 450,000 people have permanent disabilities in Bulgaria alone, yet only a fraction of them are full-time employees. JOB CARE’s main goal is to make people with disabilities “visible” to all companies out there and match skills with specific job requirements. This will not only help business to grow and find the right matches but will also find new opportunities for professional development for people with special needs. The platform was developed within an EU project, funded by OP “Human Resources Development”, co-financed by the EU through the European Social Fund. Besides Job-matching, JOB CARE also offers coaching opportunities to both employers and employees. This is the best way to help both parties “adapt” to the new new conditions of employment. Employers can create workplace suitability questionnaire and/or test on the platform to assess whether a potential employee is fit for a certain position. 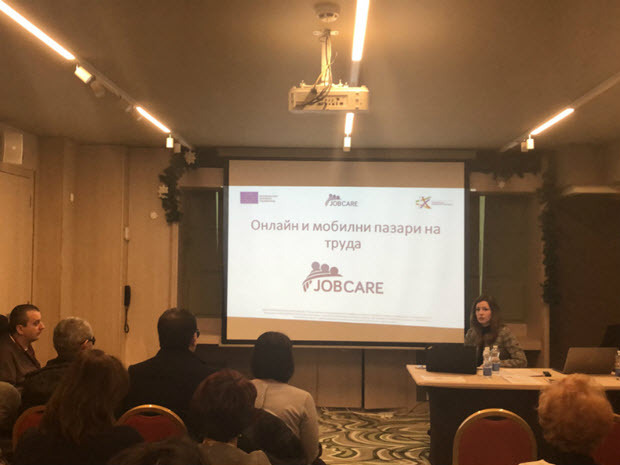 JOB CARE serves not only as a connecting platform between the business and people, but also provides support services to facilitate the adaptation of people with disabilities to specific jobs and their successful integration into the labour market. These services include workplace adaptation, career guidance, and labour law consultations.